knowledge and community at Winterfell Stables. Read below for details and dates. We encourage children to continue learning on their PA Day's even though school is out...but to do so outdoors! Join us from 9 a.m.-4 p.m. to receive riding lessons, participate in fun activities with the horses, and gain a better understanding of horses and proper care through hands-on theory exercises. Registration Info: The curriculum of this club is designed for riders 5 years or older. No experience necessary. Registrants must provide proper footwear, warm clothes, and lunch. Helmets are available for rental at $5. Maximum of 10 riders excepted. Cost is $55 plus HST. We look forward to hosting our fifth annual show in 2018! Riders of various levels and disciplines will enjoy their show day at Winterfell Stables as they compete with low entry fees for ribbons and prize money, as well as feedback from our judge, Dr. Nonie Smart. Class list featuring both English and Western classes will be available in March. Our canteen will be open with BBQ items, healthy snacks, and beverages. Dr. Nonie Smart is a life long equestrian and veterinarian with over four decades of horse ownership and riding experience. She is living proof that some of us never outgrow our love of all things equine and the desire to share this passion with others. Nonie is a certified coach with Equine Canada for both English and western disciplines. 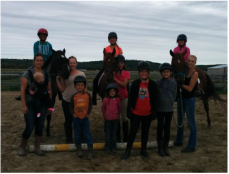 She coaches both recreational and competitive students as well as helping riders to become coaches.